These loaded sweet potato fries pair perfectly with roasted red pepper dip to take game day snacking up a notch. Preheat oven to 425˚F (220˚C). Line two large baking sheets with parchment paper. Cut sweet potatoes into 1/4 inch (1 cm) thick fries and palce in large bowl. Toss with cornstarch until all fries are coated. Add olive oil, salt, granulated garlic and red pepper flakes; toss until potatoes are well coated. Arrange on prepared pans in single layer. Roast for 30 to 35 minutes or until cooked through and starting to brown, flipping halfway through and rotating pans. 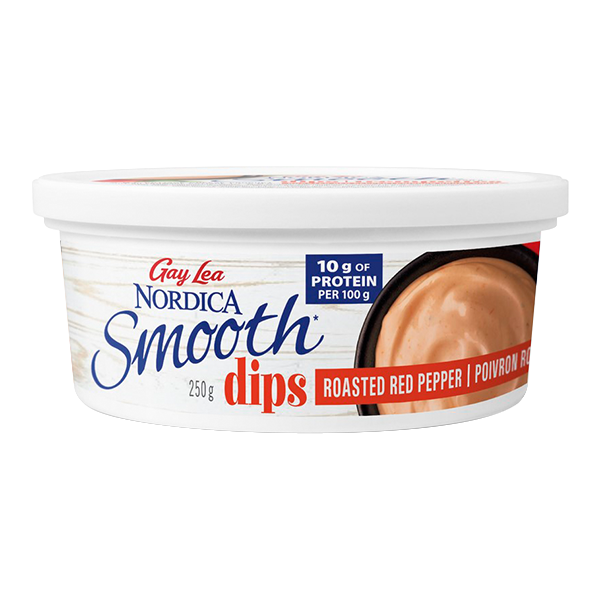 Meanwhile, in a small bowl, stir together Nordica Smooth Dip and jalapeño; set aside. In another small bowl, gently stir together the avocado, black beans and lime juice; set aside. When the fries are ready, remove from the oven. Place all the fries onto one pan; drizzle with sevel spoons of the dip mixture. Scatter avocado and black beans, green onions, red pepper, cilantro and optional toppings (if using), evenly over fries. Serve immediately with extra dip on the side. Make sure to cut the sweet potato fries as evenly as possible for even cooking.